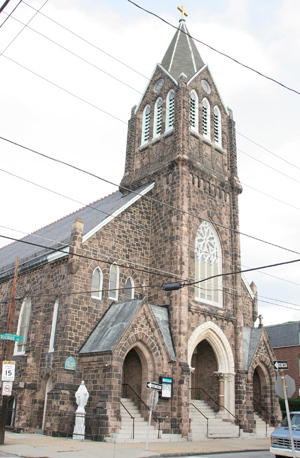 Two parishes in the Bridesburg section of Northeast Philadelphia will merge beginning July 1, the Archdiocese of Philadelphia announced Sunday, May 26. All Saints Parish and St. John Cantius Parish will merge to become a new parish at the site of St. John Cantius, with All Saints Church remaining “a worship site for the time being,” according to a statement by the archdiocese. A worship site may be used for weddings, funerals and other celebrations, as well as Sunday Mass, at the discretion of the parish pastor and the as-yet-to-be-formed parish pastoral council. Parishioners of both parishes learned of the news through letters mailed to them all and at all Masses on the weekend. Although both parishes have relatively small congregations, St. John attracts more than double the number of worshipers in typical weekend Mass attendance. According to archdiocesan statistics, St. John’s attendance rose to 635 in 2011 for its four weekend Masses, from 600 in 2007. In the same period, All Saints attendance dropped to 245 in 2011, from 344 five years earlier. The new parish is projected to have about 900 regular Mass attendees and almost 5,000 registered parishioners if all remain with the parish. 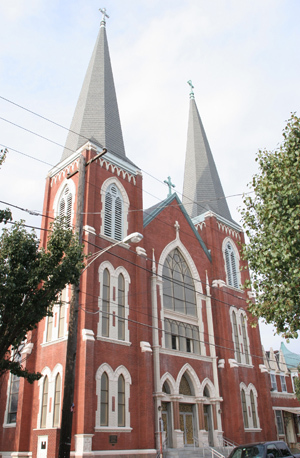 One challenge for the transition, which will be led by a new pastor who was not named, is that the smaller All Saints, founded in 1860, is a territorial parish and St. John Cantius is a personal parish for people of Polish descent living in Northeast Philadelphia. The archdiocesan statement said that the July 1 effective date was set for “canonical purposes,” or relating to the laws that govern the Church. “The actual work of the transition to a new parish community is an ongoing one that will take varying lengths of time dependent upon the unique circumstances of each merger and the needs of each parish,” the statement said. One factor in the transition’s favor is the physical location of the churches, only one-third of a mile away from each other. According to the statement, as a result of the merger all debts, assets and property of All Saints will be assumed by the new parish. The Archdiocesan Strategic Planning Committee made the recommendation for the parish merger, which Archbishop Charles Chaput approved. It is one of many announced since the Archdiocese launched its Parish Pastoral Planning Area initiative in 2011. The committee, made up of lay persons, priests and archdiocesan personnel, is examining all parishes within the Archdiocese to gauge their viability and assess whether they possess the resources to accomplish their role in the mission of the Church and remain sustainable and vibrant faith communities. In Boston all parishes remain open as worship sites if the parish is closed. The same approach should be used in Philadelphia. Any new parish takes many years to fully open. Any closed parish should take many years to fully close. In our case, Mater Dolorosa and St. Joachim are threatened with both closing. Both have many people who walk to church and that is their only alternative. If both parishes close, those people have been abandoned. That is not what Jesus would do. If the Church walks away from a neighborhood, it is an unforgivable sin. Bridesburg has dodged that bullet for the time being. We hope Frankford will do the same.